A creepy paranoid sci-fi thriller that is a great remake of an already great older movie. There are many who believe that an older movie should never be remade unless the older movie was bad. That idea makes sense because so many movies have an interesting plot, and tons of potential, but then do nothing with it. And at the end, we say, it’s too bad, because this could have really been something. And those movies should be remade and reworked to meet their potential. But are those really the only movies that should be remade? I agree that in general I’d rather see a remake of a bad movie than of a good one, because when remaking a good movie, what is there to improve on anyway? Just look at Gus Van Sant’s attempt to remake Psycho from a few years back, or any of the John Carpenter 70s classics that have now been remade (Assault on Precinct 13, The Thing.) but if there was a way to take a movie that was great on it’s own, and to find a new approach to the storyline, and explore it in a different way, then by all means, a remake would be pretty cool. Well, such is the case with the 1970s remake of the old black and white classic, invasion of the body snatchers. The remake stars Donald Sutherland and starts off right away with an exploration of what the pods are, where they come from, and how they form. That already is an addition to the original film, which didn’t really get into the details about this. It was scary in the original because the pods were just there, hidden under the surface without any explanation. And that worked. But this “remake” wants to ask the questions that the first movie didn’t ask. In that way, it really does want to elaborate on the plot and to explore the universe created by the first film, by taking it in a new direction. The pods are created in space. They rise up into the air like dust blowing in the wind. And slowly they move toward earth. Once they reach our atmosphere, they come down from the sky in the form of rainwater and hit our leaves. Then they start growing onto the leaves and eventually sprout out weird pink flowers. The whole thing is quite elaborate and even a little creepy. Especially on a second viewing when you know all that will come from them and how much these little things that are growing in front of us will change the way of our world. Like the original film, this remake is a paranoid thriller. And what better time to make a movie like that than the seventies when everything was about government corruption and paranoia. This was the decade of Nixon and Watergate. It was the decade that grew up watching Kennedy get assassinated and hearing the theories of conspiracy that surrounded it. And the movies of this decade were all anti-establishment. 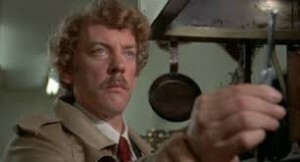 A remake of invasion of the body snatchers fit right in. The movie stars Donald Sutherland, but I like that we don’t meet him for a while and that when we finally do, it’s got nothing to do with the pods. First we meet the lead female protagonist, Elizabeth, played by broke Adams. She’s the first person who found the strange flower and noticed that there was something suspicious about it. She brings it home and starts running tests and making phone calls of inquiry. And then we meet Sutherland, who plays Matthew. He works for the board of health, inspecting kitchens for cleanliness, and we meet him on one of these runs as he busts into the kitchen, catches the cooks and owner off guard, and digs into the soup. He gets into a humorous debate with the owner and ends up leaving the restaurant, walking to his car, and finding the windshield shattered. And the guys who did it, chefs from the restaurant, are just standing over his car, not even hiding or running away. It’s a hell of an introduction to his character. That night is when the madness really begins. The flower that Elizabeth has brought home goes to work while she and her husband are sleeping, and whatever it does, it does to him. When Elizabeth wakes up, he is sweeping something off the floor and then bringing it out, not to the garbage can, but to an actual garbage truck. Whatever he was getting rid of, he sure wanted to get rid of it fast. The husband starts acting strangely in other ways too. He gives away tickets to a sports game that he was really excited about going to, for example. Elizabeth goes to see Matthew with claims that her husband has changed, and naturally Matthew laughs it off. They sit down over some Chinese food and discuss possibilities. Maybe her husband is having an affair, or maybe he’s gay. I like that the movie is in no rush to get to the aliens or pods, and instead takes the time to examine the situation like rational people might. Slowly more and more gets revealed. Matthew goes to the cleaners and the Asian man behind the counter insists that his wife is not his wife. She’s changed. They go to a book party and a woman there is saying the same thing about her husband. Of course nobody believes her. At the book party, we meet Jeff Goldblum’s character, Jack, and a good friend of Matthew’s. He’s also the comic relief of the film, especially in this first scene as he argues with people at the party. When we leave the party, we stay with jack as he goes to see his wife at the mud bath establishment that they own and run. When Jack falls asleep on one of the tables, his wife comes running in to see another creature growing beside him who is starting to look exactly like Jack, bloody nose and everything. This is the way the movie slowly starts to show us what’s going on. Of course these people have no idea what any of it means, but we certainly do. This is a movie that starts off just okay, but really gets good as it gets going. We end up with our core group of survivors who think they can take on this problem together, and one by one, we start to lose them. In that way, I suppose, it’s like from dusk till dawn, only because it’s not all in one room like that movie was, it’s actually a lot scarier. Characters go off, away from the others, and when they return, they have turned. And since we never see them bit, (or in this case, fall asleep), we don’t know that they’ve turned until the movie is ready to reveal it. And each time it is pretty powerful. This is a wild movie. It really does build up with tension every step of the way leading to an amazing ending. I certainly did think it was nothing special in it’s first half or so, interesting, but far from anything great. It’s second half, however, turned those feelings about the movie on their head. And by that point it was clear that, yes, the first half moved a little slower than the rest of the movie, but it was all for the purpose of build-up. This turned out to be a pretty cool, pretty creepy film.